"Just the man I was looking for…!" Universal has released a second trailer for the disaster action movie Skyscraper, following the first trailer which dropped during the Super Bowl earlier this year. Skyscraper stars Dwayne Johnson as former FBI Hostage Rescue Team leader and U.S. war veteran Will Sawyer, who now assesses security for skyscrapers. When a fire breaks out on a big tower in China, he's framed for it, and finds himself on the run while trying to save his family trapped inside the burning skyscraper. This also stars Pablo Schreiber, Neve Campbell, Roland Møller, Kevin Rankin, Byron Mann, Chin Han, Paul McGillion, and Adrian Holmes. They've admitted this is inspired by Die Hard, and it certainly has that vibe, which actually makes me want to see it even more if I'm honest. This looks like it might be badass. You can also still watch the Super Bowl spot for Skyscraper here, or catch the first official trailer again. 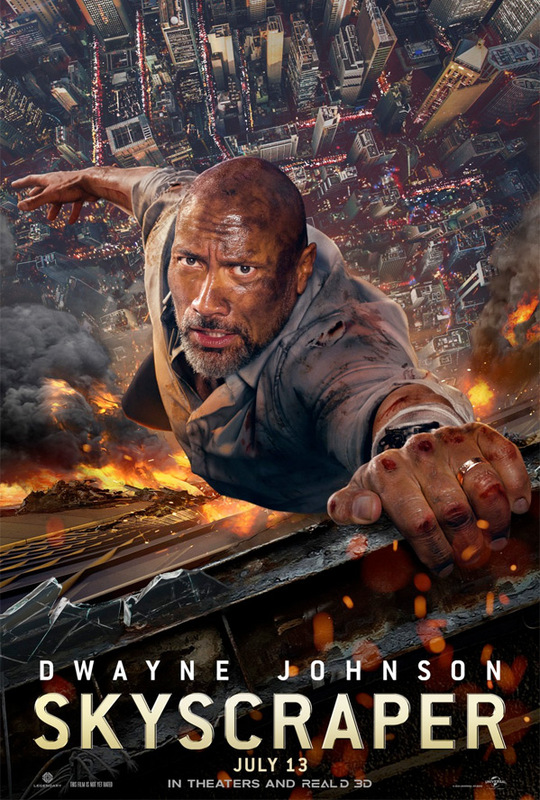 Dwayne Johnson leads the cast of Legendary's Skyscraper as former FBI Hostage Rescue Team leader and U.S. war veteran Will Sawyer, who now assesses security for skyscrapers. On assignment in China he finds the tallest, safest building in the world suddenly ablaze, and he’s been framed for it. A wanted man on the run, Will must find those responsible, clear his name and somehow rescue his family who is trapped inside the building… above the fire line. Skyscraper is both written and directed by American filmmaker Rawson Marshall Thurber, director of the films Dodgeball: A True Underdog Story, The Mysteries of Pittsburgh, We're the Millers, and Central Intelligence previously. Universal will be releasing Legendary's Skyscraper in theaters everywhere starting on July 13th later this summer. Who's excited to see this one?